The West 79th Street Funk Jazz Band ON AIR! Friday October 26th, 2014 @ 12:00 PM. DON'T MISS IT! Band Leader George Woods alongside Guitarist Extraordinaire Lorenzo Grassi. 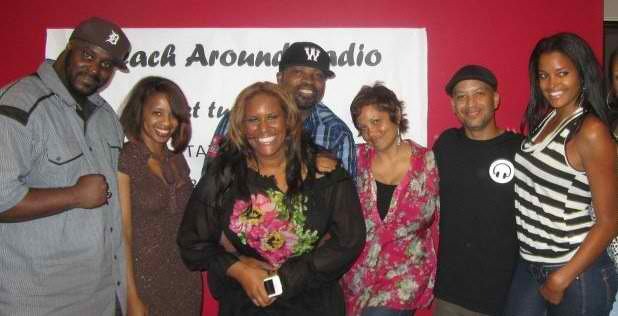 Reach around radio consists of funnyman Speedy, radio/music veteran Felicia “The Poetess” Morris, TV host/model Claudia Jordan, comic-writer TDP, and DJ Alwayz. The show is aired and streamed live utilizing UStream to telecast RAR’s raucousness live in-studio on LATalkLive.com and making greater use of social media to maintain their accessibility. George had a hard time getting the band members names right and Funny man Speedy took advantage of it. Get it right next time George! The West 79th Street Funk Jazz Band Featured in the Burbank Business Journal performing for the Burbank Chamber of Commerce mixer at Castawy's. "It's always good going back to the hood, giving back, and playing for the community!"